Czar plums are good for eating, cooking and bottling and suitable for the majority of UK locations due to several factors, one of which is the blossoms resistance to frost. If you live in parts of the UK where you suffer Tsunami's and trees being ripped out of the ground by hurricane force winds then we don't think the Czar plum tree is for you. 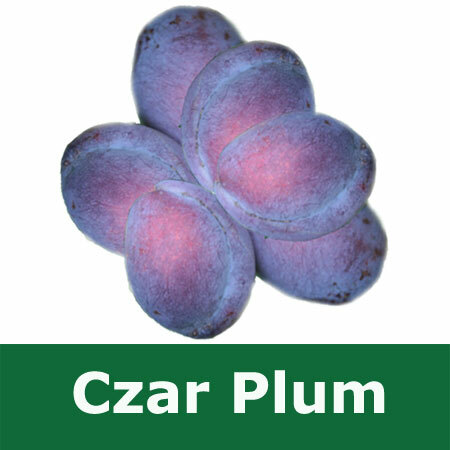 As a growing tip, allow the Czar plums to ripen to a darker colour as they become a little sweeter and juicier. Small bit of trivia/brain numbing text to fill the page, the Czar plum tree is so named because it was created in 1874 which is the same year as Tsar Alexander The Second, Russian head of state visited UK. The last time we were so honoured/inconvenienced was 2003 when President Putin visited/spied us. Buy the smaller Pixy root stock if you would like the tree to provide plums quicker. As a general rule, the smaller the rootstock of the Czar bare root plum tree, the quicker it will provide plums compared to the larger root stocks e.g. St Julian A.
Maiden St Julien A Grows to 3.5m : One year old, cheapest option and can be pruned to any shape or form you require. Pixy / VVA1 Grows to 3.0m :2-3 yeas old, usually in bush form (contact us first if this is important to you) Provides fruit quicker than larger root stocks. St.Julien :Could also come on Adapt root stock. Slightly larger tree and provides larger crop than smaller rootstocks e.g. VVA1/Pixy. Fertility: (C3) SELF FERTILE. Will provide some plums if planted by itself.